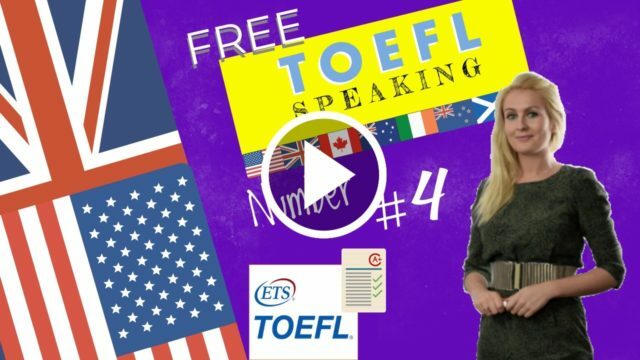 The best way to get a good mark in the TOEFL Speaking Test is to prepare your answer before speaking. We will give you various templates that you can adapt to answer any question. This will not only make your answer easy to understand but also fluent. What the TOEFL-Speaking Question 4 consists of. You first read an academic passage for 45 seconds. Then, you listen to a lecture related to the academic passage. For question 4 you have 30 seconds to prepare your answer and 60 seconds to give your answer. Your preparation time begins as soon as you hear the prompt, and your answer time begins as soon as your 30 second preparation time is done. At 60 seconds, the recording STOPS. It cuts off. It ends. So be sure to include all the details you need before the 60 second mark. TOEFL Speaking-Question 4 is an integrated question. This means you must read and, or listen to a resource before preparing and answering the question. In TOEFL-Speaking question 4, just like question 3, your answer MUST be objective. This means use the third person for the ENTIRE answer, using words like “he”, “she”, “it”, and “they”. Stay calm. Do not get blinded by science. Question 4 is SUPPOSED to be difficult. You will probably learn something new. But remember: part of what TOEFL is testing is your ability to learn new things in English. You DON’T need to remember every single word from Question 4 vocabulary. Just pick out the main ones that relate to the “classification” (explained below) and note those down. Don’t worry about the others . In psychology, the feeling of complete and energized focus in an activity is called flow. People who enter a state of flow lose their sense of time and have a feeling of great satisfaction. They become completely involved in an activity for its own sake rather than for what may result from the activity, such as money or prestige. Contrary to expectation, flow usually happens not during relaxing moments of leisure and entertainment, but when we are actively involved in a difficult enterprise, in a task that stretches our mental or physical capabilities. I think this will help you get a picture of what your textbook is describing. I had a friend who taught in the physics department, Professor Jones, he retired last year…Anyway, I remember…this was a few years ago…I remember passing by a classroom early one morning just as he was leaving, and he looked terrible: his clothes were all rumpled, and he looked like he hadn’t slept all night. And I asked if he was OK. I was surprised when he said that he never felt better, that he was totally happy. He had spent the entire night in the classroom working on a mathematics puzzle. He didn’t stop to eat dinner, he didn’t stop to sleep…or even rest…he was that involved in solving the puzzle. And it didn’t even have anything to do with his teaching or research; he had just come across this puzzle accidentally, I think in a mathematics journal, and it just really interested him, so he worked furiously all night and covered the blackboards in the classroom with equations and numbers and never realized that time was passing by. Explain flow and how the example used by the professor illustrates the concept. Nothing to do with work, for fun. Important Note: Be sure to ANSWER the question in the prompt. This is what the TOEFL graders want. They do NOT want to hear a ramble about every detail in the lecture. Flow is a state of complete and energized focus on an activity. We often lose the sense of time while in flow, while greatly stretching our mental capabilities. In the lecture, the professor talks about a friend of his who works in the physics department. A few years ago, early in the morning, the professor saw his friend in terrible condition, he looked like he hadn’t slept all night. Yet he was in a completely happy mood. Apparently, the physics professor had been working on a mathematics puzzle for the entire night and had completely lost track of time. It wasn’t even for his job. He just wanted to do it for fun. This is the example the lecture gives and how it relates to the concept of flow. The lecturer elaborates on this by providing several examples/an example. In this way, the professor expands upon the topic of _____. (Optional). Spend 15 seconds on the summary of the academic passage and 45 seconds on the content of the lecture, specifically addressing the prompt. Be enthusiastic with your response. TOEFL graders do NOT want to hear a bored robot. Inject some life into it!